Oh, to have a perfectly white smile that could make The Grinch blush. Wouldn’t that be nice? Everyone deserves to have a beautiful smile, and whitening treatment can get you the one you’ve always wanted. While teeth whitening can’t make your smile perfectly aligned or address every problem you may have, it can make your teeth look fantastic, sometimes up to several shades whiter. How does one take advantage of this awesome dental treatment? Why, at Boston Smile Center, of course! Our team of dental professionals in Brookline, MA have years of teeth whitening experience and can discuss all of your options. There are a lot of factors that go into deciding which treatment to use, and our office employs a few whitening services that are convenient for your schedule. Are you ready to learn all there is to know about the teeth whitening services we offer? It’s an incredible lineup! For the best teeth whitening 02446 residents can enjoy, look no further than our office. Beautiful smiles aren’t reserved for Hollywood stars and starlets. Having a smile that shines bright doesn’t have to be that difficult to attain. In fact, it’s pretty easy — especially when you come to the office of Dr. Alan Sasson in Brookline, MA. Cosmetic dentistry is something we excel at and delivering a beautiful smile is something that we have perfected over the years. We staff one of the best teams in the area and their expertise in the industry know-how is evident in everything they do. If your smile could use a bit of an upgrade with teeth whitening, straightening treatment or any other type of cosmetic work, we’ve got you covered with a plethora of options. Are you ready to take your smile to the next level? What are two words that, when said out loud, strike fear into the hearts of everyone within an earshot? Those words are “root canal.” This treatment is infamous for being extremely painful and uncomfortable. The true, however, is the exact opposite. With modern advancements in dental technology and trends, root canal therapy is painless and comfortable, so long as it is conducted with professional hands. 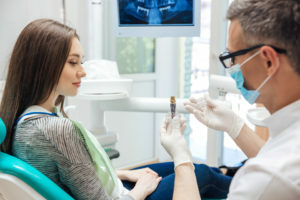 Boston Smile Center & Implant Dentistry, an upper echelon practice, provides straightforward, professional root canal therapy for those who reside in Brookline, MA. We understand that root canals cause a lot of anxiety and stress. Who wouldn’t feel a tinge of fear after hearing they must undergo the procedure? Our doctors, a duo of seasoned professionals with decades of experience in the field, and their hand-selected team of crack dental experts are passionate about providing amazing, unmatched oral health and hygiene for every patient that enters our building. With an office equipped with advanced dental technology and a constant upkeep of the latest dental practices, our team can ensure that every procedure will restore your mouth to pristine form. A root canal is necessary whenever the inner section of the tooth – known as the pulp – becomes infected or inflamed, which can occur due to decay, tartar, poor hygiene, etc. When infected, abscesses can form and excruciating pain can take hold. During our root canal therapy, we will apply an anesthetic to numb the area surrounding the tooth and place a dam, preventing moisture from creeping in while we work. We will drill a small hole in the tooth and remove the infected pulp. After removal, we will clean and disinfect the inside of the tooth. The tooth is then filled with a biocompatible substance, and a crown is placed over the hole. After the procedure is complete, you can walk out of our office with a healthy smile stretched across your face. Don’t let an infected tooth ruin your day. Boston Smile Center & Implant Dentistry can correct the issue and restore your tooth to a healthy state. Contact our office today and schedule your appointment to receive comfortable, pain-free therapy. Our services are available to those who live in Brookline, MA, Boston, Newton, Cambridge, and the neighboring communities.